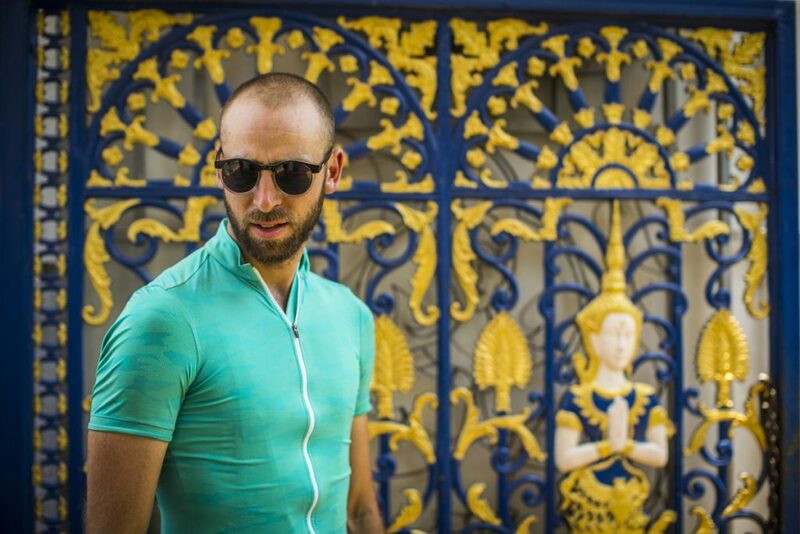 In the face of scorching heat and forgotten bike parts, Cyclist embarks on a multi-day journey through Thailand and its less-trodden north-eastern reaches. We’re in the Isan region, where less than one in every 100 visitors to Thailand venture. The missing axle is a 142 x 12mm thru-axle, and there isn’t a bike shop for 1,000km, let alone one that would carry such a specific part. We’d press on, Tim using a borrowed bike, me on a Diverge Carbon Pro, both axles intact. 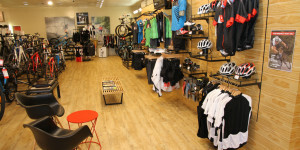 Of course, we would later see an upside to the lack of high-end bike shops. Isan is very peaceful and mostly devoid of foreigners. It’s Thailand, but not as seen on TV. How peaceful? Well, for a start, days would pass before we’d encounter a traffic light. 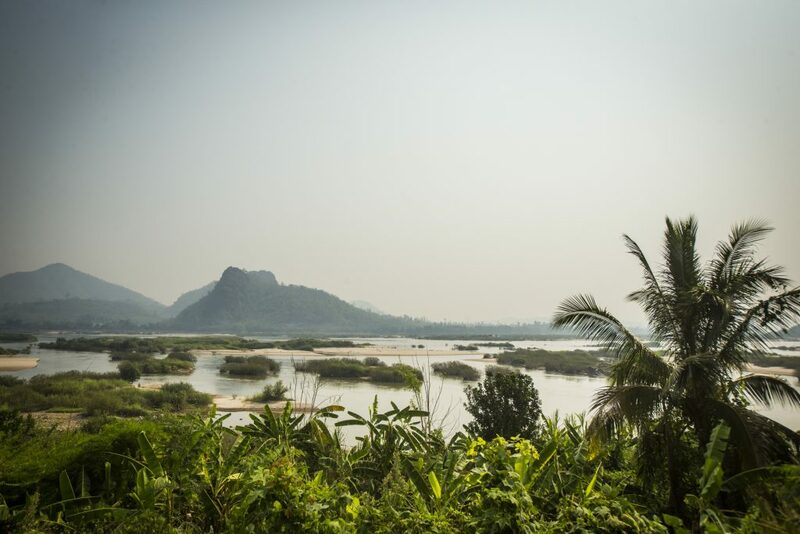 Although a significant proportion of our route followed a highway tracing the Mekong River bordering Laos, traffic was thin and lacked the discordant symphony of bells and whistles that defines the usual experience on Asian roads. How devoid of foreigners? Back in Australia, we sometimes play a lame game called “Horse”. It’s a simple game. You’re riding. You see a horse. You say “horse.” You get a point. If you say “horse” but it’s not a horse, it’s a cow, you lose a point. It gets old quickly. While in Isan, Tim and I played a similar game: Farang. Farang means foreigner in Thai. It’s a simple game. You’re riding. You see a foreigner. You say “Farang.” You get a point. If you say “Farang” but it’s not a farang, it’s a cow, you lose a point. It didn’t get old. Our cumulative score was 11 over six days of riding. Like I said: peace and quiet. Landlocked Isan comprises a third of the population and land area of the Kingdom of Thailand. It’s equivalent in size to half of Germany, twice Tasmania. 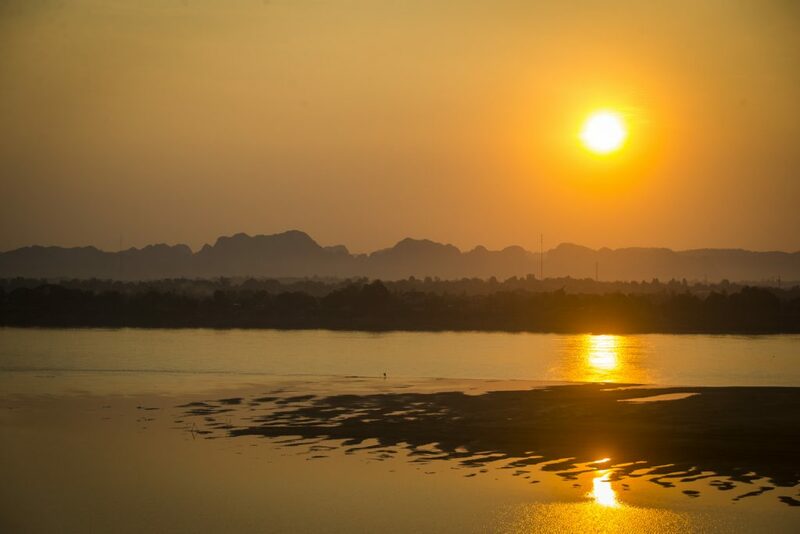 It includes about 20 provinces and is bordered by Laos and Cambodia. 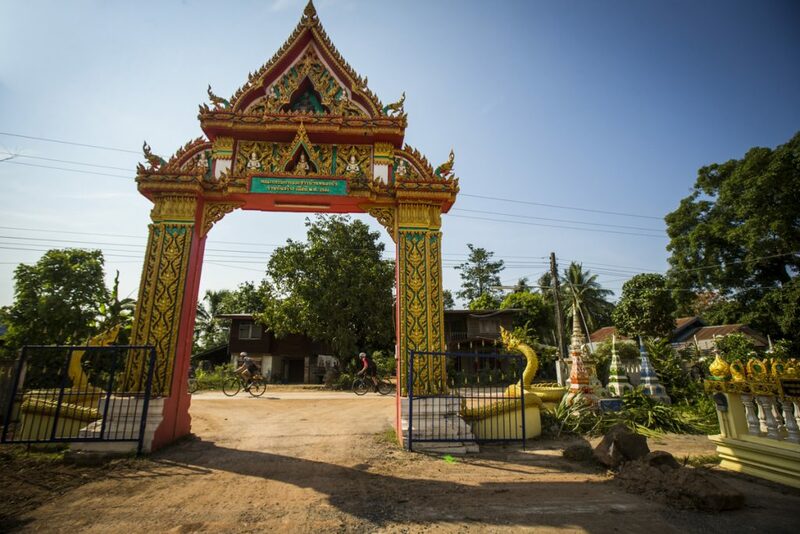 Its anthropological roots trace back to the great Khmer empire, famous for the trans- religious Hindu-Buddhist temple complex Angkor Wat in Cambodia. Khmer empirical rule spanned almost all of South East Asia and lasted from the 9th to 15th centuries CE. 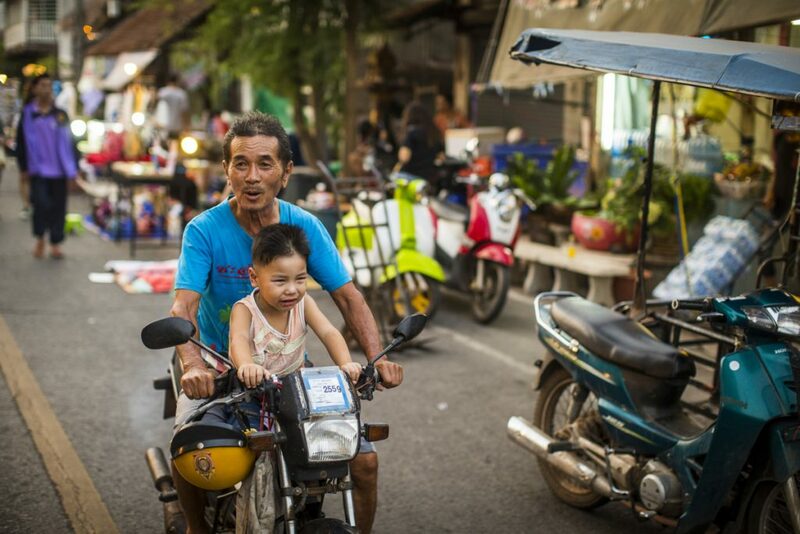 Although the vast majority of Khmer people live in modern-day Cambodia, around one million live humble lives in the Isan region, now part of sovereign Thailand. The historic influence of Khmer language, culture and cuisine exists in the foreground and differentiates the region from other parts of Thailand. 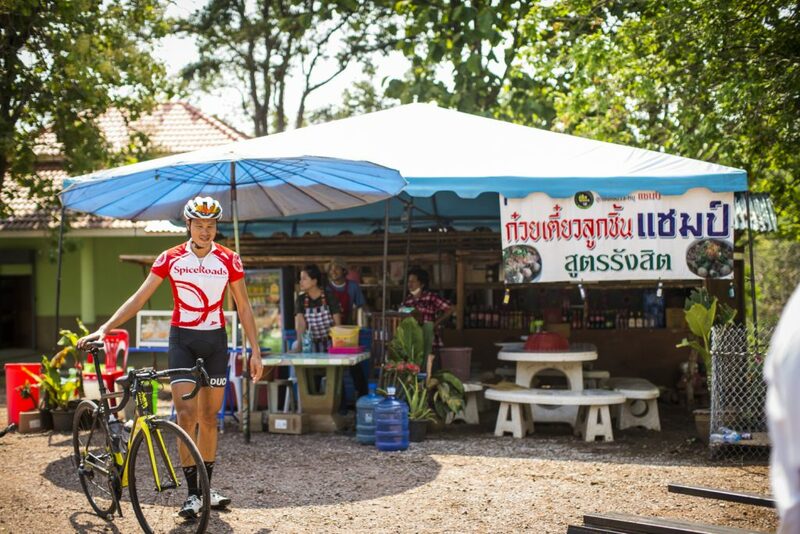 Astride our bikes, midday sun overhead, we begin our Big Ride from Loei Airport into the surrounding mountains. As we reach the outskirts of the dusty city, we stop at a pineapple stand, excited to get stuck into roadside food. Mental note – these beautiful, fresh pineapples are going to be a key fuel for the trip. I’ve even read somewhere that Team Sky rates pineapple. 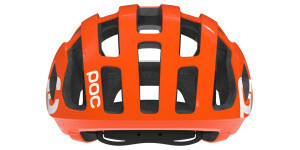 Marginal gains. Tropical gains. We buzz along the hot-mix for only a few kilometres before the road tips skyward and we pour with sweat, already dehydrated by the three-flight transfer. We continue to climb for around 20km up to a plateau shouldering the south face of Phu Ruea peak. The heat generates greasy sweat slime on bar tape, leaving salty snail trails. As we crest, we realise there’s no real crest. It’s more of a slow step down the other side of the plateau towards the Mekong River basin. 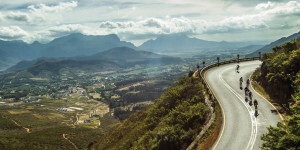 By day’s end we cover 90km and climb around 1,000m, a perfect introduction to the kind of cycling that’s possible here. We wake in the morning and discuss route options with our Thai guide and all-round nice guy, Aum. ‘Sounds like “arm”,’ he says. Aum isn’t from Isan, and he’s a proper roadie. Shaved legs, tan lines. All that. We get lost in the usual guff. Metres. Kilometres. Switchbacks. B-roads. It’s clear there are many routes through the range that surrounds Phu Ruea, but our schedule takes us further north-east, away from the mountains and toward the Mekong River bordering Laos. 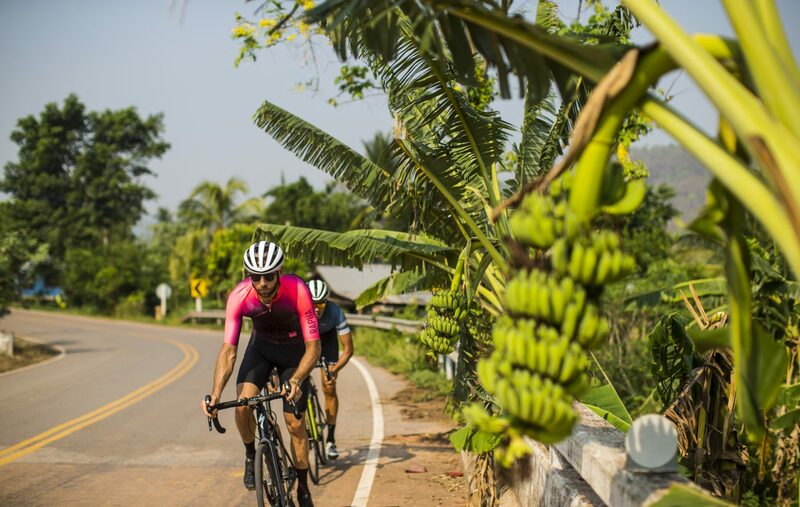 Our itinerary, prepared by Spice Roads, is a condensed version of a longer trip not-so-creatively called “Mighty Mekong River by Road Bike” and is designed to be a flatter route than the company’s other offerings, such as tours in the north-west around Chiang Mai. This isn’t the sprawling, low-lying Mekong Delta region. The Mekong stretches almost 4,500km from its mouth in the south to its source high in the Tibetan Himalayas, and we’re about halfway along at this point. We don’t see river canoes skipping across palm fringed estuaries and canals. We see a wide river supporting farming. We see fishing. 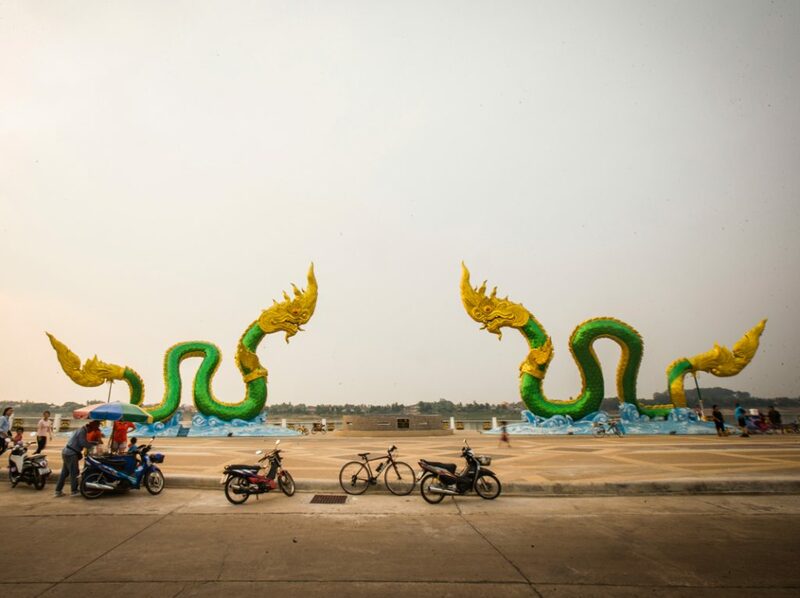 We even see a fake Mekong giant catfish, the roadside idol paying proud homage to the largest freshwater fish in the world, weighing up to 350kg. Inevitably, we also see sand mining. Caravans of small tip-loaders spill sand and river water along the road. Bulldozers and barges fight for position, extracting sand. Primarily as an input for concrete, it’s the ‘most-used natural resource in the world after water – more than oil and gas’ – according to a 2014 United Nations Environment Program report. Demand for the resource has risen with China, and the scale is staggering. The growing Chinese economy consumed more concrete in the three years between 2011 and 2013 than the entire USA consumed in the entire 20th century. 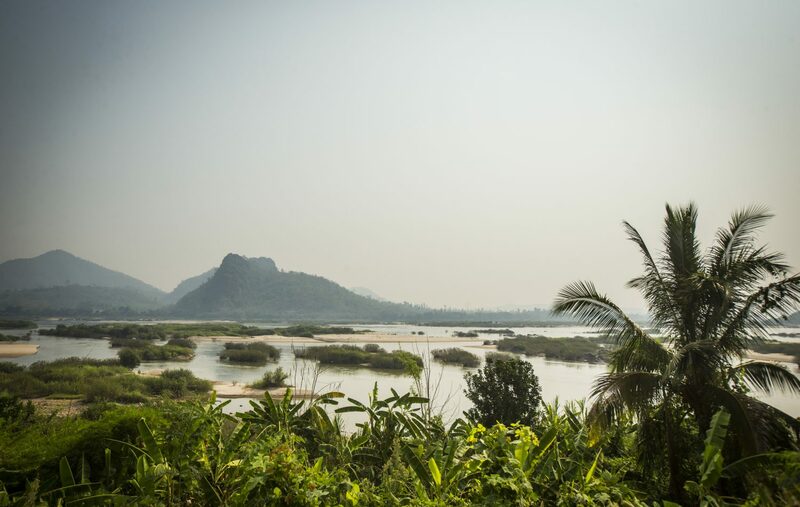 This is one of several threats that faces the Mekong as it makes its way through six countries on its journey to the South China Sea. 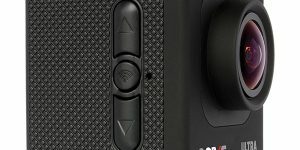 It also contends with disputes over environmental management, water rights and damming. After a tough, mostly flat day of riding, speckled with silty spots from the road, we slump in our hotel room, and Tim uploads the day’s photos onto his computer wearing nothing but cotton boxers and a hairy chest. He reckons the photos look ‘pretty sweet’, so we head out for an evening beer at sunset by the Mekong, the dim lights of Laos flickering on the opposite bank. The morning greets us with a hazy sunrise after an overnight thunderstorm. It’s already 30°C at 8am. We roll out on the steamy road, through farmland pressed up against the banks of the river like it’s trying to have a drink. The undulating road, which mostly follows the river and hides from the hills, occasionally pinches up over a shoulder or into a gully. The pinches become more laboured and the bidons empty faster following each effort. As the day goes on, the heat begins to rise. Eventually it’s 43°C and shade is scarce. 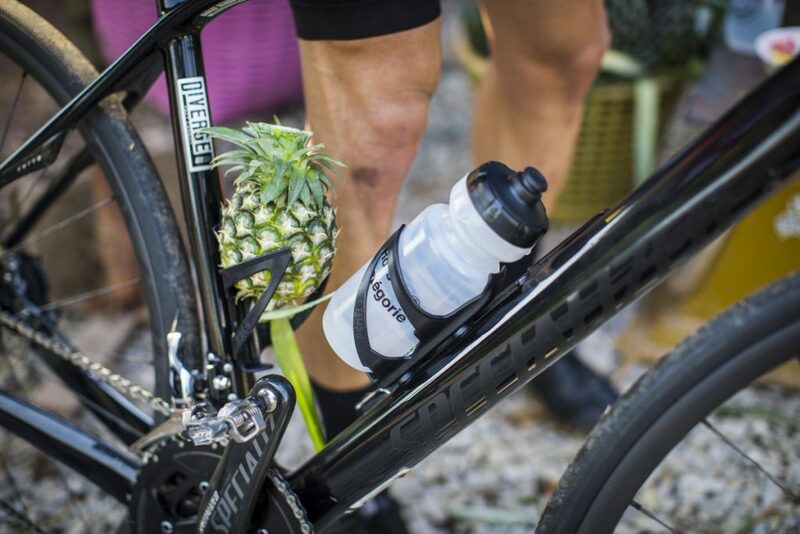 We stop regularly to eat pineapple, fill our bidons and stuff ice into our jersey pockets. The road tips upward again. It’s melting – gooey black tar sticks and clicks. It’s too much. We pack it in 117km into a 130km day and sheepishly crawl into our air-conditioned sag wagon, deciding not to contest the final.Next it’s time to go through our afternoon post-ride routine, mostly involving sitting around in our undies drinking beer and uploading to Strava. We debate if it’s a good or bad thing that it usually says ‘no segments found’ on a five-hour ride. In the evening it’s time for a new experience: a walking dinner. Chiang Khan has a charming night market. 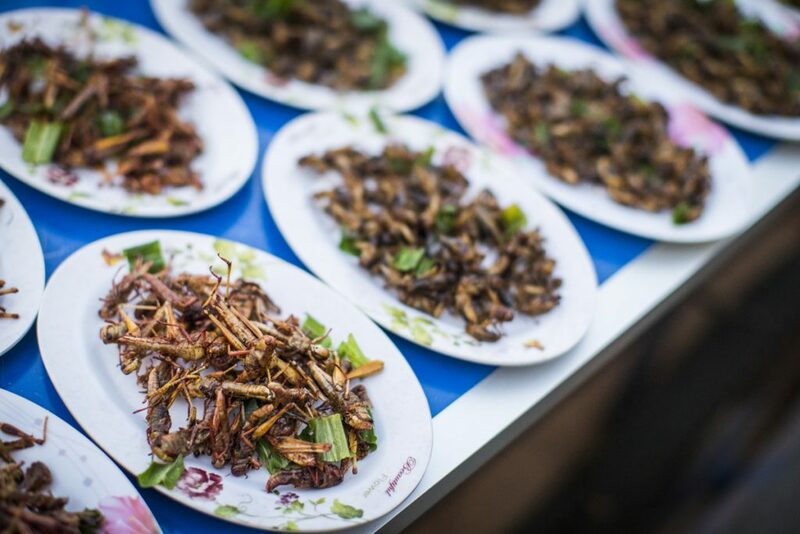 While sampling grilled pork, steamed buns and skewered school-prawns from street sellers – followed by delicious coconut ice cream for dessert – Aum previews our next destination, Nong Khai. ‘It’s the gateway to Vientiane, capital of Laos, and there’s a cool religious statue park there called Sala Keoku,’ he explains. Neither Tim nor I are really sure what to expect. In the morning we weave our way through light traffic on Nong Khai’s industrial outskirts. As we round a corner we see towering depictions of Buddha sitting proudly beside Hindu gods – including Kali, female god of time and death. Kali stands tall holding the head of Raktabija (a demon), which she lopped off with a sword before drinking every drop of his blood. We come in peace. We wander deeper into the park, gazing in awe at the sculptures’ scale and numbers. Built from concrete in 1978, the park was designed by Bunleua Sulilat, an eccentric sect leader and mystic. 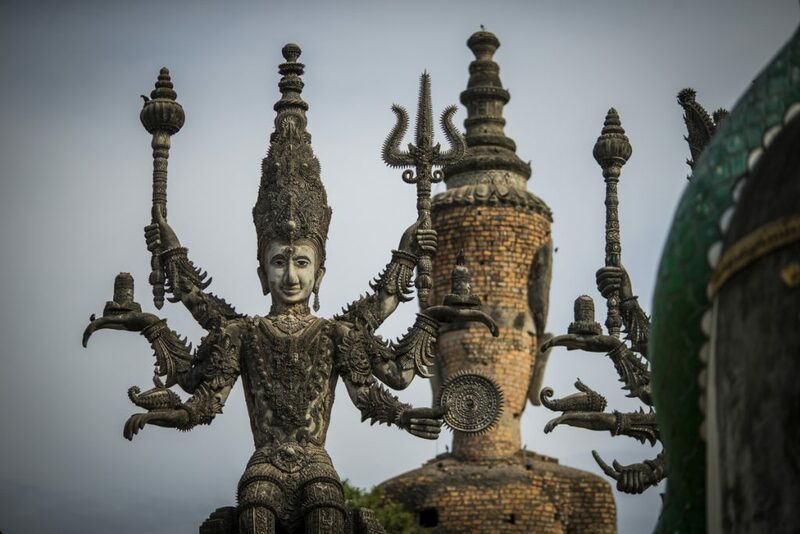 It was his second concrete sculpture park, depicting a pantomime of gods, creatures and characters from both Hinduism and Buddhism, and it became a mecca of sorts for his followers. Sulilat’s fantastic sculptures tower up to 25m high, and although it’s not an ancient temple complex like Angkor Wat, Tim and I find it to be fascinating. Sulilat’s body is mummified in a concrete building in its centre. We leave the sculpture park and follow a damp clay road beside the river toward Nakhon Phanom, our final destination on the tour. We sit down to a late breakfast of local pan-eggs with pork-sausage-filled sweet bread before rolling out to explore town. We have no need to cover great distance today – just see some sights. Rolling along the river with the Laotian Annamite Mountain range peering over the horizon, we make a stop at the newly built Friendship Bridge Number 3. The bridge reaches across the Mekong to Laos. We look at our maps and realise that this point in Thailand is also perhaps the nearest point in the country to Vietnam. It’s known as Nakhon Phanom, and it was a refuge for many Vietnamese in the Indochina Wars. Vietnamese revolutionary Ho Chi Minh lived i a small wooden house on the fringe of town while exiled from Vietnam. Tim and I ask Aum if we can pay a visit to Ho Chi Minh’s old house. ‘Sure!’ he says, clipping in, ready to go. We go. The short and enthusiastic caretaker-slash- tour guide of Uncle Ho’s humble wooden house speaks over Aum faster than he can translate to us. It’s unclear exactly when Uncle Ho lived here, but we gather it was for around five years from around 1928-1932. The simple structure is kept cool by its clever design, providing shade from the now-very- familiar overhead sun and allowing the natural breeze to flow though. The surrounding market garden offers papaya, mango and jackfruit. It’s not hard to imagine Uncle Ho sitting tall at his desk writing letters that would change the course of the region’s history. And that’s what this trip was all about for your writer: the region’s story. Time and time again, we’re reminded how much travel by bicycle can enrich an overseas trip. Essentially, there are two things make travel by bike different from travel in vehicles. One, pace – moving at human speed allows time to absorb. And two, proximity – you’re on the ground, all the time. You live, and you learn. 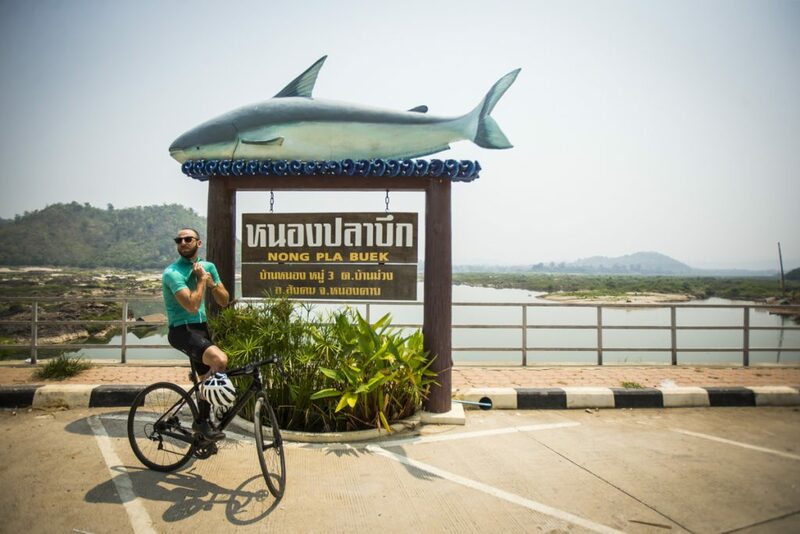 The Mighty Mekong River by Road Bike is a 700km-odd journey in the north- east corner of Thailand. 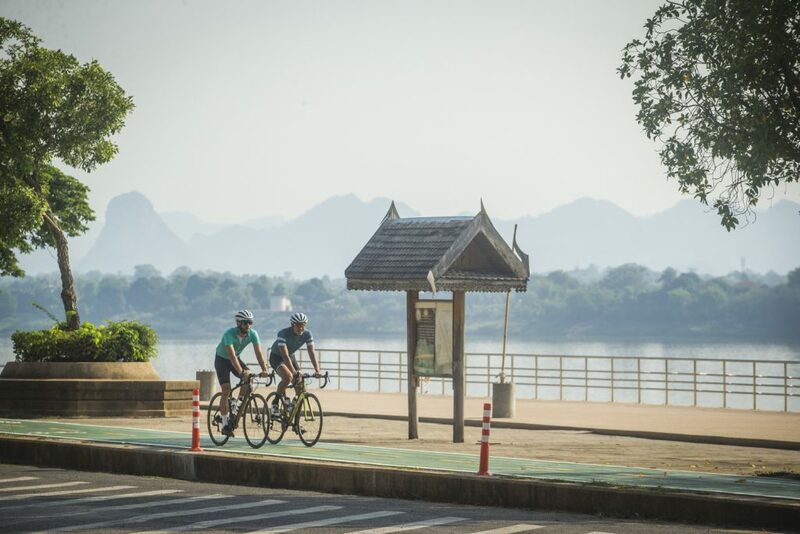 Following the river border between Thailand and Laos, this is as much about the riding as it is experiencing the life, food and culture of a more remote part of this oft-visited country. 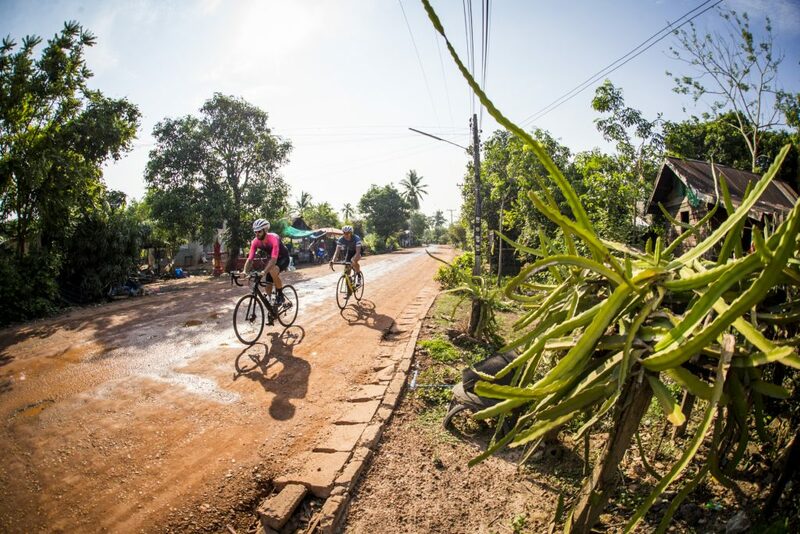 The eight-day, seven-night trip, with six full days of cycling (though Cyclist did a condensed version), is given a three-chilli rating by Spice Roads, who led our tour. Don’t let the moderate difficulty fool you – it’s a challenge for riders of any ability. The easiest way to kick off the tour is to fly to Bangkok and make a domestic connection at Loei. It’s here that Spice Roads will meet you to begin the tour. Don’t fancy taking a bike across? Not a worry – Spice Roads can accommodate those sans-steed with a high-quality road bike suitable for the task. For more information, head to spiceroads.com/tours/mighty-mekong. I rode a 2016 Specialized Diverge Pro Carbon. 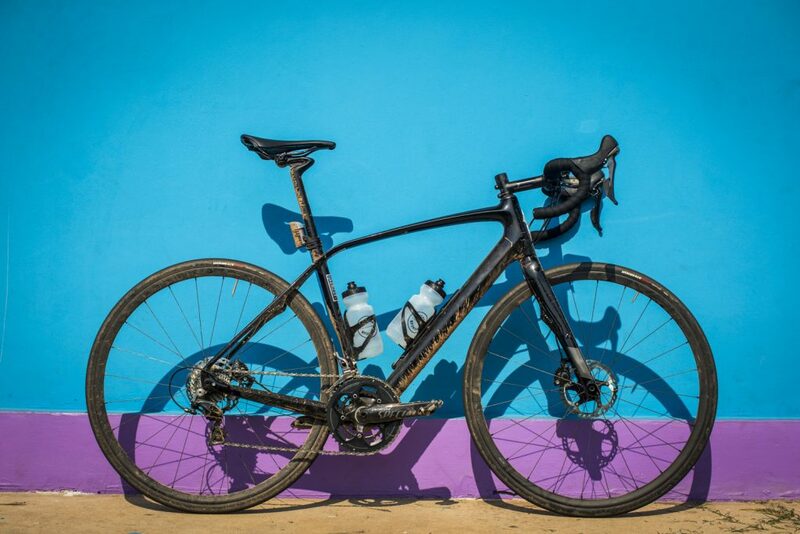 It’s Specialized’s range- topping Diverge and is designed to go fast when the going gets tough. 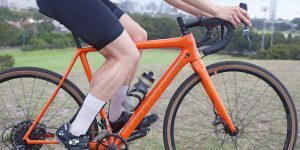 Built with a mix of 11-speed mechanical Dura-Ace and Ultegra, compact cranks, generous clearance, thru-axles and hydro-disc brakes, this is a very capable gravel grinder or exploring rig. I had no hesitation taking it across a goat track between rice paddies when we wanted to check out a roadside quirk. The wider tyres allowed me to ride confidently when conditions were unpredictable. However, it’s also surprisingly fast and eager on sealed roads. 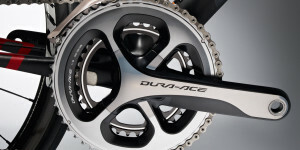 On days where a TT rig would have done the job, the Diverge was no slouch. It comes stock with Roval Control Carbon rims and 28mm Roubaix tyres, which I ran at around 70 Psi. We never leave home without a frame pump, rear Flux light, and a small bell. 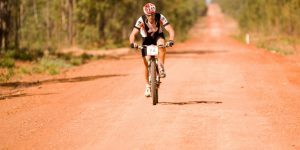 I decided to use Shimano XTR SPD pedals, which allowed me to walk around road-side stalls, markets and sights comfortably in gum-soled Specialized lace-up Recon mixed terrain shoes. 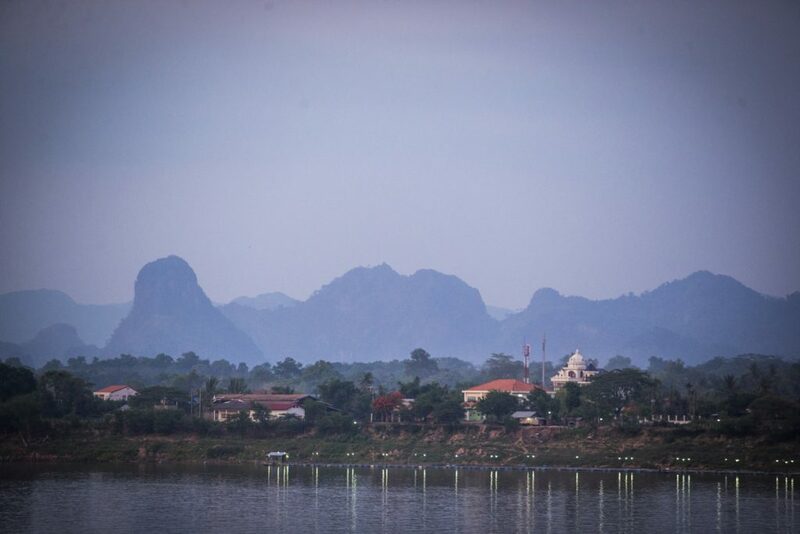 Our route began in Loei, a short domestic hop from Bangkok’s airport. We explored the Loei region for two days before journeying north-east to Chiang Khan. 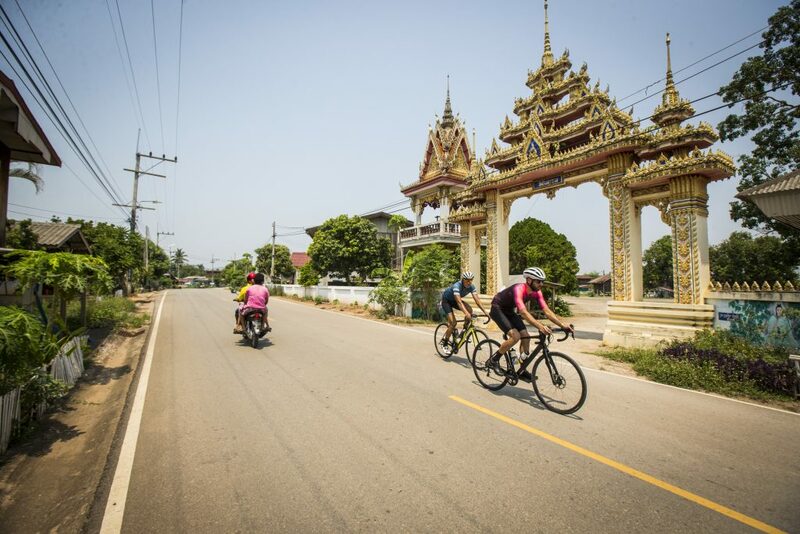 We rode flatter roads following the Mekong River for another four days via Nong Khai and Pak Khat to Nakhon Phanom, where we boarded a domestic flight back to Bangkok. Thai Airways flies direct to Bangkok from Melbourne, Sydney, Brisbane, and Perth. Nok Air – Thai Airways’ budget carrier, which got us to and from our start and finish points – run many flights to and from Isan. We enjoyed the tour courtesy of Tourism Thailand and our on-ground partner, Spice Roads. Special thanks to Aum, our tour guide, and Mister Rin, our jovial driver. We’d also like to thank Rapha Australia for keeping us comfortable and in some very cool hot-weather kit. 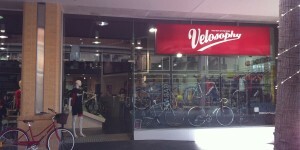 Thanks to Specialized Australia for letting us give their beautiful bikes a workout. Well, one at least. For more information, see spiceroads.com/tours/mighty_mekong.